ANSWER: Iowa has three former players enshrined in the Pro Football Hall of Fame. They are: NFL all-time interceptions leader Paul Krause (81), Emlen Tunnell (79 interceptions, ranking second) and linebacker Andre Tippett (100 sacks). But there’s no doubt several former Iowa players should be on the short list for future honorees. Duke Slater was the NFL’s most dominant lineman throughout his 10-year career, which ended in 1931. At the time he retired, Slater had earned seven All-Pro selections, the second-most at that time in NFL history, according to Neal Rozendaal’s biography of Slater. He started 99 games and played 60 minutes in 90 of them. Slater, who played primarily f or the Chicago Cardinals, posted a dominant performance against the Chicago Bears in a 40-6 win in 1929. For multiple years, including 1927 and 1929, Slater was the only African-American allowed to play in the NFL. After Slater announced his retirement, Lew Byrer of the New York Telegram wrote, “As long as I’ve played and watched football, the greatest tackle I ever saw was Duke Slater of Iowa. He was colored and received little credit.” Slater already has a jersey and shoulder pads in Canton. It’s a shame his bronze bust wasn’t immortalized when the Hall of Fame opened in 1963, even more of a shame that it’s still not there 50-plus years later. As a four-time Pro Bowl selection and three-time All-Pro, Alex Karras was one of the NFL’s best defensive linemen in the 1960s. He was named one of three defensive tackles on the NFL’s Team of the Decade in the 1960s alongside Dallas’ Bob Lilly and the Los Angeles Rams’ Merlin Olsen, both of whom are inducted in the Hall of Fame. Of the six defensive linemen on the 1960s all-decade team, Karras is the only one not inducted. Karras started for 12 years in Detroit as part of the original Fearsome Foursome defense. He played in 161 games from 1958 through 1970, although he joined Green Bay Packers running back Paul Hornung on the sidelines in 1963 for a gambling suspension. Karras was a defensive force and deserves inclusion. Perhaps no former Hawkeyes player is more overlooked by Hall of Fame voters than former Chicago Bears center Jay Hilgenberg. After landing with the Bears as an undrafted free agent in 1981, Hilgenberg moved into the starting lineup in 1983 and became a permanent fixture for a decade. Hilgenberg was a seven-time Pro Bowl player from 1985 through 1991 and started each season for the NFC squad. He was named All-Pro in 1988 and 1989. In 1985, Hilgenberg guided the NFL’s top rushing attack and second-ranked scoring offense to a 15-1 regular-season record and a Super Bowl victory. His 12 postseason starts are tied for the most in Bears history. Only six other Bears have more Pro Bowl appearances than Hilgenberg and all of them are in the Hall of Fame. Only four other centers in NFL history have more Pro Bowl appearances than Hilgenberg, and all of them also are in Canton except recently retired Kevin Mawae. In the Dallas Cowboys’ first great era under coach Tom Landry, John Niland was a vital component. Niland remains the highest-drafted offensive lineman in Dallas history after he was selected fifth overall in 1966. Niland moved into the starting lineup late in his rookie season and played for the Cowboys through 1974. He won a Super Bowl, played in another and started in legendary playoffs games such as the 1966 NFL title game against Green Bay and the 1967 Ice Bowl loss to the Packers. Niland started 14 playoff games in Dallas, including six NFL/NFC championship games. Only seven Cowboys have more Pro Bowl appearances than Niland’s six. That’s just as many as quarterbacks Troy Aikman and Roger Staubach. Five times Niland was named a Pro Bowl starter, and four times he was nominated as the NFL’s Man of the Year. He deserves to be discussed by Hall of Fame selectors. Marshal Yanda’s NFL career is far from over, but the Baltimore Ravens’ guard has built a Hall of Fame résumé. Yanda has six Pro Bowl selections (2011-2016), and he twice has been named All-Pro and twice named second-team All-Pro. 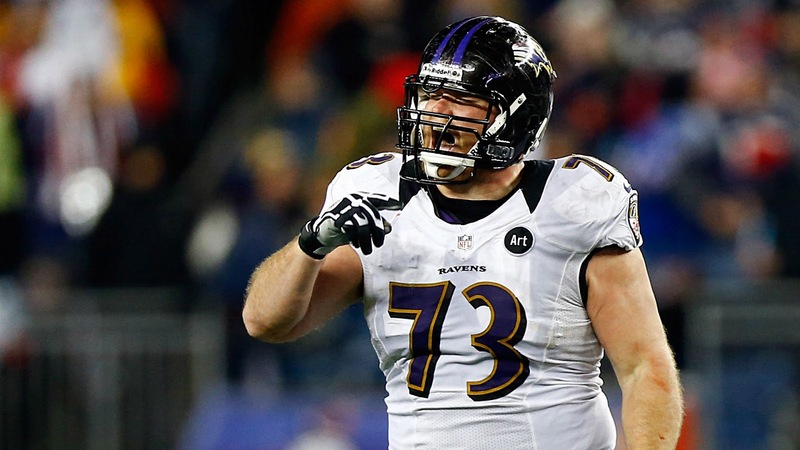 Yanda nearly earned a Pro Bowl berth in 2010 when he moved to right tackle because of a teammate’s injury. According to Pro Football Focus, Yanda has not given up a sack since Week 7 of the 2015 season and has surrendered only 5 sacks since 2012. In 2016, Yanda shifted from right guard to left guard after a shoulder injury and still was PFF’s top-graded guard for the entire season. Yanda was PFF’s top-ranked guard in 2015 and top-rated offensive lineman in 2016. Yanda has started in 12 playoff games and won one Super Bowl. From 2014-17, Yanda was the highest ranked guard in NFL Network’s top 100 list. Yanda will need to wait five years after his retirement to be nominated for the Hall of Fame, and his position might preclude him from immediate induction. But he is every bit as Hall of Fame-worthy as any guard the last 20 years.